I've used the goo by itself a few times basically on a speaker that was going to be garbage anyway if I didn't do something. It has always held up until a replacement was located and with the grill cover on no one would be the wiser. Look at frame 58 of a thread on crossovers for the T/S parameters on the K-8-K.
BTW is there a tread for collecting T/S parameters? We need one. 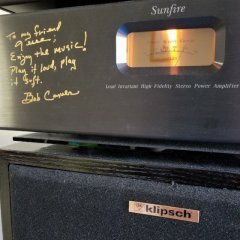 What a great idea to start a thread for Klipsch T/S parameters. I would like to find a K-8-K replacement woofer! Any suggestions beyond EBay (which I have checked). Anything for sale here on the forum? Any help would be greatly appreciated! Ebay or the forum is your best bet. Try a wanted in the 4 sale section. Thank you so much. Perhaps you could answer another question for me. Inside the cabinet there are white connecting wires and white connecting wires with a red line along the length of the wire. There are 4 places to connect the wires to the woofer (2 from the woofer above it and 2 from the cross over). I can't remember which wires to where but I am thinking the two red line wires go on one side of the woofer and the 2 white wires go on the other side with no mixing them up. Also I would be interested to know the size of the sheet metal screws that attach the woofer to the cabinet. I have not seen the inside of one. But. It is highly likely that the woofers are wired in parallel. It seems that you are describing this. It is also highly likely that the wires with the red stripe go to the positive terminal of the woofers. The positive terminal is often marked with a + (plus sign) or a dab of red paint. If not, match the location of the upper woofer terminal attachment location. If you can get to the crossover board, you should find a similar indication of polarity and the white-red wire will be attached to it accordingly. One of our members here pointed out that the Klipsch site for the USA no longer has very much information on discontinued speakers (like the KG-4) but that the Australian site does. So you might want to download and save or print while the info is available. BTW and FWIW, I use the free Bullzip PDF printer to save information which appears on the browser, and other programs It appears like a hardware type printer on your list of printers. But simply creates a .pdf file when you print to it. Sometimes it is slow, so just wait up to 30 seconds and it will prompt you to set a file location and pop up Adobe Reader. Probably you already know this. It is often more accurate than a similar Adobe product. I applied some superglue to harden up the screw hole. Of course wait until the glue sets before inserting the screw. If there is a more extreme problem let me suggest inserting a little cylinder of paper to add more material to the hole and then superglue. Great and very helpful information! Thank you so much! Yes there are products which can help to make and to keep rubber supple. Here is a good one often used for parts such as rubber capstan rollers and other working rubber parts. Excellent company and products. Absolutely first class. I'm new to the forum, but noticed this thread. If anyone still needs a single K8K, I have one in excellent condition. How much? Can you post a photo or 2 of it? Thanks! I'll snap a couple pics and get them up. Not looking for any more than postage and packing costs.